It's crucial for patients of all ages to have a strong foundation of proper oral hygiene and professional care. At Mosaic Smiles, our experienced Vienna team of family dentists and dental care providers strive to stop problems before they begin, and we’re happy to provide comfortable treatment that leaves you with a confident smile. It's recommended that all patients visit our Fairfax, VA practice twice a year for an in-depth check-up and hygiene appointment. During your evaluation, Dr. Elgeddawi or one of our other doctors will thoroughly examine your teeth, gums, jaw, bite, and other crucial areas that influence oral health. Digital X-ray technology will also provide us with detailed images of structures we can’t view with the naked eye in only a few minutes. Once we have all of this information at our disposal, we can work with you to create a personalized plan of action for how to effectively treat your unique smile. Once your check-up is finished, you'll also undergo a teeth cleaning appointment with one of our hygienists. These periodic cleanings help clear away stubborn plaque and tartar that buildup on your enamel and refresh your smile. Did you know that periodontal disease affects nearly three out of four American adults? That's a staggering number, and one that we take very seriously here in our Fairfax, VA dental practice. Dr. Elgeddawi and the rest of our team diagnose the presence of periodontal disease at the earliest possible stages, and offer several treatment options to reinvigorate your oral health. In many cases, symptoms of periodontal disease may not be obvious to the untrained eye until it’s progressed to a more advanced and destructive stage. 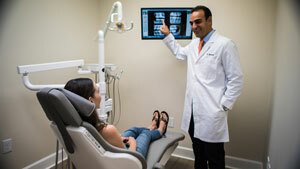 That’s why we strongly recommend attending regular check-ups at our Fairfax practice. Our team offers patients multiple periodontal therapy options for successfully treating gum disease, and we’ll recommend one to treat your unique case. For mild instances of the condition, lengthier, more frequent cleanings may be all that’s needed to reverse the negative effects. An in-depth periodontal therapy treatment known as root scaling and planing is also available, which cleans the areas between the teeth and gums and smooths the surfaces of tooth roots. Dr. Aly Elgeddawi and Dr. Hisham Barakat are also able to provide revolutionary soft tissue treatment for removing diseased tissue in a precise, comfortable manner. Do you constantly wake up with severe headaches and facial pain? Do your teeth feel or look worn down for no reason? These may be signs of bruxism, also known as teeth grinding, a common habit with disastrous consequences to your oral health and overall wellbeing. Thankfully, our office provides much-needed relief in the form of a personalized oral appliance. This nightguard can be worn comfortably during sleep, protecting your smile from ill-effects and giving you a full night of peaceful, worry-free rest. 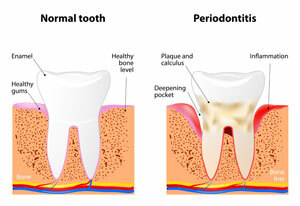 Did you know that periodontal disease affects nearly three out of four American adults? That’s a staggering number, and one that we take very seriously here in our Fairfax, VA dental practice. Dr. Elgeddawi and the rest of our team diagnose the presence of periodontal disease at the earliest possible stages, and offer several treatment options to reinvigorate your oral health. Our Fairfax practice recommends the use of custom-made sportsguards for athletic patients so their smiles are protected while they play basketball, baseball, football, hockey, and countless other sports that may result in dental damage. 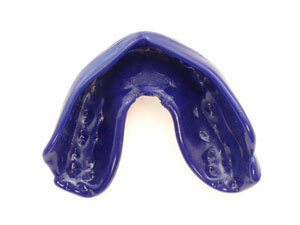 Studies have shown that the effects of concussion may be reduced in severity when the patient wears a sportsguard. The pits and grooves of back teeth can be tricky to clean, especially for young patients. This leads to better odds of lingering bacteria and cavities forming over time. Our Fairfax dental team offers sealants as an effective method for minimizing the risk of tooth decay. By painting this durable, plastic material directly over the enamel, we can block potentially dangerous bacteria from settling, and help patients avoid cavities as they improve their brushing and flossing habits. While not as widely discussed in the dentist’s office as periodontal disease or cavities, the presence of oral cancer can devastate a patient’s life. Studies show that one American, on average, dies every hour from oral cancer, and half of diagnosed patients won’t live more than five years. This is why our team at Mosaic Smiles makes diagnosing oral cancer a top priority during regular dental exams. At your biennial checkup, we’ll thoroughly scan your mouth for telltale signs of cancerous cells, and if we find anything suspicious, we’ll help you take the next steps towards a more concrete diagnosis. Are you ready to achieve the healthy, happy smile of your dreams? Contact Mosaic Smiles today to schedule your first appointment with our friendly family dentists! Our team looks forward to exceeding your expectations with our quality approach to preventive dentistry. Located in Fairfax, VA, we also serve the nearby areas.